Easy Online Reviews offers reputation management services. Get your Free Online Reputation Guide NOW to help you with your Business Reputation Online. A Harvard Business School study showed that EACH additional Star rating on Yelp increases Revenue by 5-9%. A Cone Online Influence Report concluded that 80% of people say that NEGATIVE online information changed their minds about purchasing a product or service. By intercepting negative impressions immediately and managing the customer before he or she can voice a negative opinion online, a business owner can ethically and appropriately handle a disgruntled customer and, at the same time, reduce the probability that the disagreement will go “viral”. The Easy Online Reviews platform automatically posts customer reviews instantly to your business Facebook page as well as the reviewer's Facebook Wall. This creates a viral effect by exponentially spreading the word about your business. Easy Online Reviews has the marketplace’s most sophisticated software available to logically assist your customers to do what they would do naturally. It helps them easily say nice things when you do the competent, professional job you do routinely. And, when there is a slip up, it guides them to alert management in ways that do not do permanent damage to your reputation. That is proactive reputation management. That is Easy Online Reviews. Custom branded online video commercials for your business! 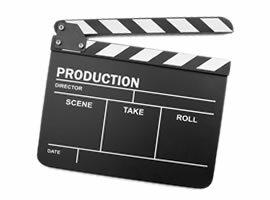 Learn more about our studio quality videos and how they can benefit your business. Tired of customers leaving your business without leaving you a review? 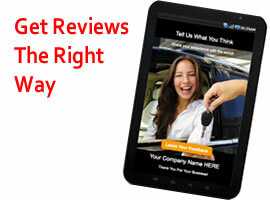 Our mobile review application makes it easy to collect reviews at the point of sale.